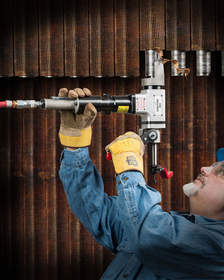 HOLLISTON, MA--(Marketwired - Mar 25, 2015) - ESCO Tool has introduced a patented portable tube fin removal tool that features a new aggressive rack-and-pinion feed mechanism and side ratchet to rapidly peel back HRSG tubes. The Fin MILLHOG® Tube fin Removal Tool is an I.D. clamping, self-centering pneumatic tool featuring a proprietary blade that cleanly separates the fin from the tube. Upgraded with a new robust rack and pinion feed with easy to operate side ratcheting, this tool is capable of peeling back a 4" (101mm) fin from a tube O.D. in less than two minutes. Available for left- or right-hand spirally wound fins, the Fin MILLHOG® Tube fin Removal Tool mounts rigidly and has no torque reaction to the operator. Equipped with a 1.25HP pneumatic motor, the range of the tool is 1.25" I.D. to 3.0" O.D. and it can be used in any orientation to permit rapid inspec-tion and X-ray of the weld and eliminate the need for chippers or grinders. For over 50 years, ESCO Tool has worked closely with end-users on the toughest tube and pipe cutting and end prep applications in the power generation and metalworking industries. Their experience has allowed them to invent and manufacture high quality, torque-free end prep tools that work efficiently and require no special operator training. The ESCO product line features their robust line of MILLHOG® pipe milling tools and Air-Powered Saws and specialty mount systems, High-Speed Hand-Held Bevelers, and accessories. Offered for sale or rent, with 24 hour shipment or less usually available, these field-proven tools are built tough and precision machined from the finest materials to make sure that you get your job done properly, on time, and under budget. The Fin MILLHOG® Tube fin Removal Tool is an I.D. clamping, self-centering pneumatic tool featuring a proprietary blade that cleanly separates the fin from the tube. Fin MILLHOG(R) Tube Fin Removal Tool is available from left- or right-hand spirally wound fins.